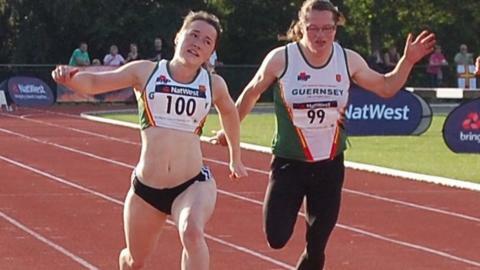 Guernsey Island Amateur Athletics Club has been named the south east development club of the year. Saint Andrew's Lee Merrien ran in the Olympic marathon in the summer but the club's work across all age groups was praised by the judges. "We're really proud of this award," GIAAC development officer Stephen Green told BBC Guernsey. "We've got a good junior programme and athletes like Lee Merrien - and up-and-coming athletes have done really well." The award means the club goes through to the national final with the chance of being named the best development club in the country. GIAAC has organised a number of events to get people involved in track and field, such as their All-Terrain Challenge and Easter Running Festival. "We've had several big events and our athletes are doing well, plus we have a good all-round development plan. "As it's an Olympic year every club stepped up their game, so we were in a massively competitive field," said Green. He believes encouraging young athletes has been the secret to ensuring that the club has continued to flourish. "I use a top-down and bottom-up approach," he explained. "If you get the seniors performing well it has a positive effect on the juniors. "But if you build a good junior competition those juniors become hungry and it pushes the seniors as well. "That's what's happened this year, we've had great events and people in the club have been motivated to improve."